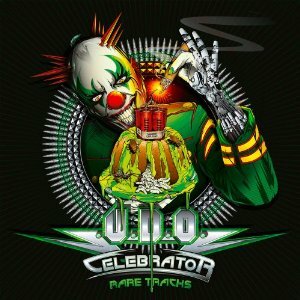 Celebrator is the new release from U.D.O. - the band fronted by former Accept singer Udo Dirkschneider. It's hard to believe but U.D.O. has been around for 25 years - the band's first album (Animal house) was released in 1987. While Accept have released only a few albums since Udo's departure, he has been far busier, releasing a steady stream of new albums, with last years "Rev-Raptor" being ther most recent U.D.O. album and whcih was also the band's biggest commercial success. Celebrator is not a new studio album, but instead is a collection of rare tracks, spread over two CDs. As well as marking 25 years of the band U.D.O. this album coincides with the 60th Birthday of Udo himself. So what do we get in the album? A few collaborations (with Raven, Faktor 2, Hammerfall, and Lordi), some remixed tracks, some rare unreleased tracks and a piano version of the Accept classic, Balls to the Wall. Often when a band released a collection of rarities and previously unreleased tracks, it's painfully obvious why they weren't released before - they just arent that good. Luckily though Udo Dirkschneider is too much of a professional to release a load of left over second rate material, and instead has packed the album full of great tracks. This is all really good stuff without any filler. If you only know Udo Dirkschneider for his work with Accept then you've missed out on a lot of great music - U.D.O. is a band you really need to listen to. There is plenty of good stuff on this album and its definitely worth buying. If you like this then make sure you also check out Rev-Raptor too. Udo Dirkschneider shows here why he's lasted so long in the music industry - he makes great music, and has one of the most recognisable voices in metal. An excellent album.